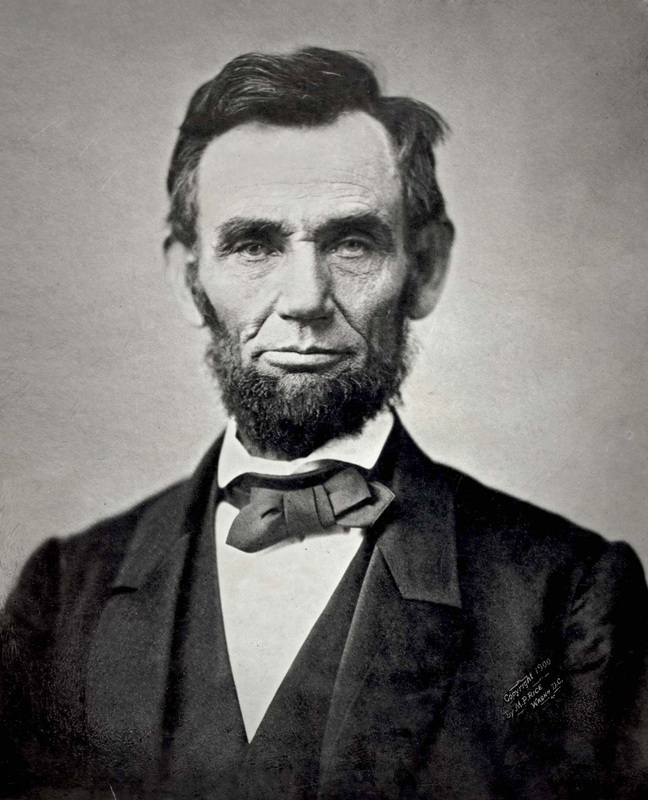 In October, 1863, Sarah J. Hale’s fifteen year effort to have the last Thursday of November become a nationally recognized day of Thanksgiving became a reality when, in the midst of the Civil War, Abraham Lincoln issued a proclamation in response to Ms. Hale’s letter. Ms. Hale is often referred to as the Godmother of Thanksgiving, and earned a special place in the hearts of parents and children as the author of “Mary Had a Little Lamb”. When American family and friends get together on Thanksgiving, they should give thanks to Ms. Hale for her efforts. 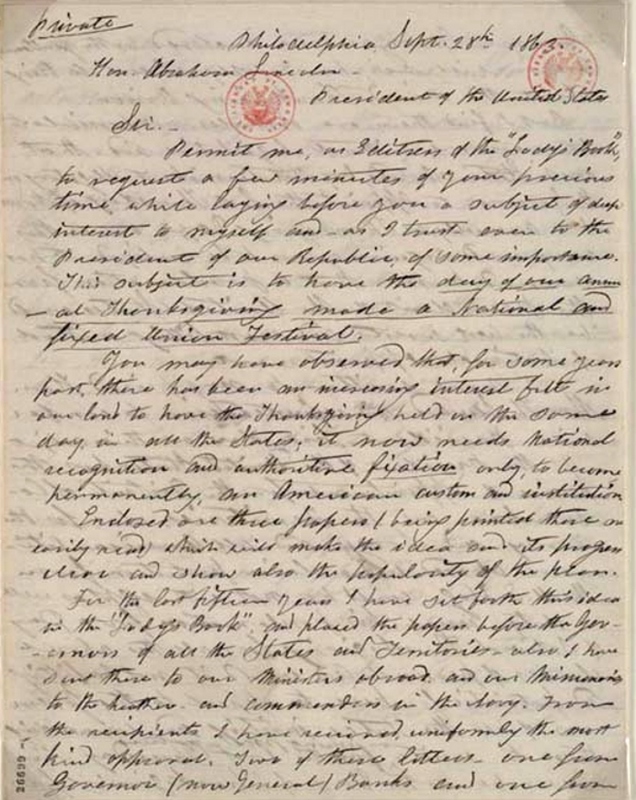 Below is her letter, followed by Lincoln’s proclamation in response. For the last fifteen years I have set forth this idea in the “Lady’s Book”, and placed the papers before the Governors of all the States and Territories — also I have sent these to our Ministers abroad, and our Missionaries to the heathen — and commanders in the Navy. From the recipients I have received, uniformly the most kind approval. Two of these letters, one from Governor (now General) Banks and one from Governor Morgan are enclosed; both gentlemen as you will see, have nobly aided to bring about the desired Thanksgiving Union. But I find there are obstacles not possible to be overcome without legislative aid — that each State should, by statute, make it obligatory on the Governor to appoint the last Thursday of November, annually, as Thanksgiving Day; — or, as this way would require years to be realized, it has ocurred to me that a proclamation from the President of the United States would be the best, surest and most fitting method of National appointment. I have written to my friend, Hon. Wm. 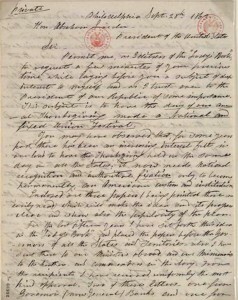 H. Seward, and requested him to confer with President Lincoln on this subject As the President of the United States has the power of appointments for the District of Columbia and the Territories; also for the Army and Navy and all American citizens abroad who claim protection from the U. S. Flag — could he not, with right as well as duty, issue his proclamation for a Day of National Thanksgiving for all the above classes of persons? And would it not be fitting and patriotic for him to appeal to the Governors of all the States, inviting and commending these to unite in issuing proclamations for the last Thursday in November as the Day of Thanksgiving for the people of each State? Thus the great Union Festival of America would be established.